This concert featured some of classical music’s premier young voices from the Juilliard School of Music along with a special appearance by the legendary Itzhak Perlman, accompanied by his long-time collaborator, pianist Rohan De Silva. 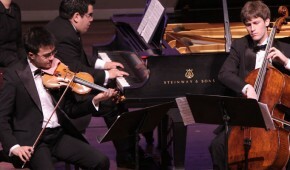 The performers included Juilliard’s Graduate Resident Quartet Biava String Quartet (Austin Hartman and Hyunsu Ko, violins, Mary Persin, viola, and Jason Calloway, cello) together with guest artists clarinetist Tibi Cziger, bassist Andrew Roitstein and percussionists Alexander Lipowski and Michael Caterisano and the N-E-W Trio (Andrew Wan, violin, Gal Nyska, cello, and Julio Elizalde, piano). Works performed included several rare masterworks from the early twentieth-century Russian Jewish school of composers. These included Alexander Krein’s 1910 Jewish Sketches, #2, Joel Engel’s Dybbuk Suite (1922), Leo Zeitlin’s Eli Zion (1914), Solomon Rosowsky’s Fantastic Dance, and Mikhail Gnesin’s Requiem Trio (1943). Complementing these older pieces was a performance of composer Osvaldo Golijov’s contemporary classic, The Dreams and Prayers of Isaac the Blind (1994). For further information on these pieces, please see The Musical Tradition.